Since 2015, LABION has been working on the characterization by Raman spectroscopy of Extracellular Vesicles (EVs). EVs are nano-vesicles released by almost every cell of our body, during health and disease, and they are interesting vehicles of proteins, lipids and other bioactive molecules that can be used in therapy (for example, regenerative rehabilitation of diseased or ageing tissues) or as biomarkers of complex diseases, like neurological disorders. LABION has developed a straightforward method for the biochemical characterization of EVs before their use in regenerative medicine to speed up tissue repair and recovery that was publish in 2017. Now, an advancement of the technique and a further demonstration of its feasibility and successful use in stem cell derived EV characterization has been published. 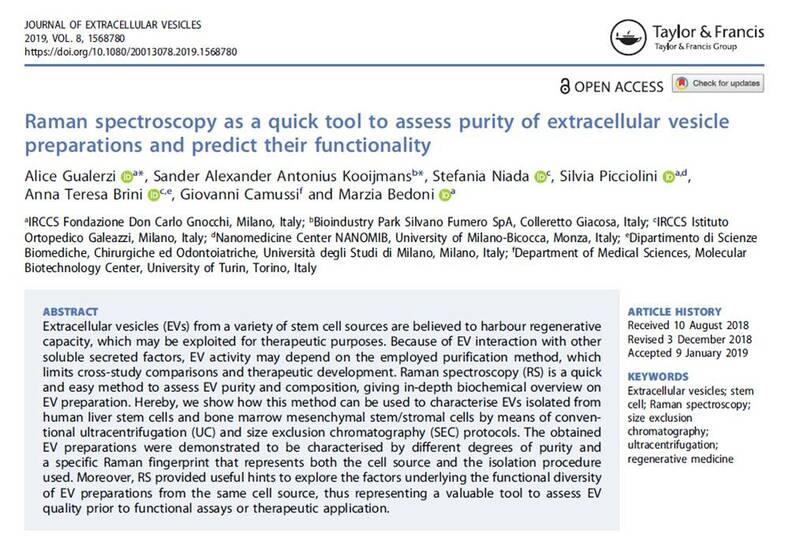 In this paper, we hypothesise that Raman analysis can be introduced in the pipeline of stem cell-derived EVs production as quality control and as a tool to identify the best EV-isolation procedure for a specific cell type, accelerating their application in a clinical environment.